Extenders for Nintendo NES & SNES - Compatible with Nintendo SNES Classic Edition controllers, NES Classic Mini Edition (new 2016 model that has the HDMI socket and the built in games, NOT the original 1985 NES model) and Nintendo Wii remote controller, Wii nunchuck controller. Simple to Use - Just plug & play. The Nintendo SNES Extension Cord can be used with 2 controllers plugged in to the console simultaneously, so both players are able to sit back and relax. You can even put two extensions together to make one super-long cable. 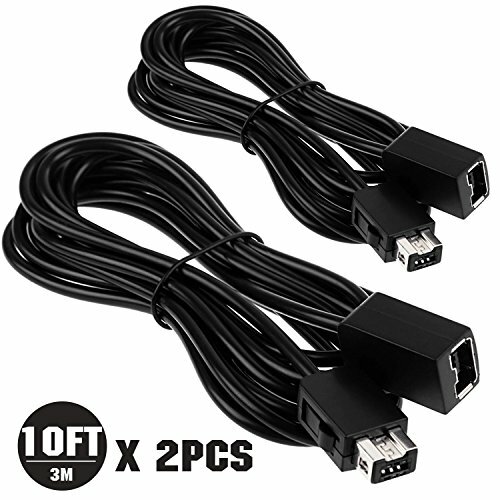 Long Enough Cord for Comfortable Gaming - 2 pack 10ft/3m cord extend the reach of the controllers so you can play comfortably without sitting face to face with the screen. Advanced Marterial Quality - This super snes extension cable cord is designed from top quality, sturdy material that will last long. Plastic cord sheathing is soft and flexible, not overly hard like other cheap cords. Warranty Policy - 12 months warranty time, just rest assure to buy.If there is any concern or question about this NES extension cords. Please just feel free to contact us.